Here’s what’s up in the world of TV for Thursday, March 31. All times are Eastern. You, Me, And The Apocalypse (NBC, 8 p.m.): The apocalypse is coming! The apocalypse is coming! After expertly blending comedy and drama for the past nine episodes, this British/American series finally comes to an end tonight. The premiere’s opening flash-forward already offered a brief glimpse of Earth’s destruction as well as at least a few surviving characters. Now the show fills in the gaps as everyone races to the safety of Slough’s underground bunker in the last hours before the comet hits. To mark the momentous occasion, we asked Emily L. Stephens to come out from her own underground bunker and weigh in on the apocalyptic finale. 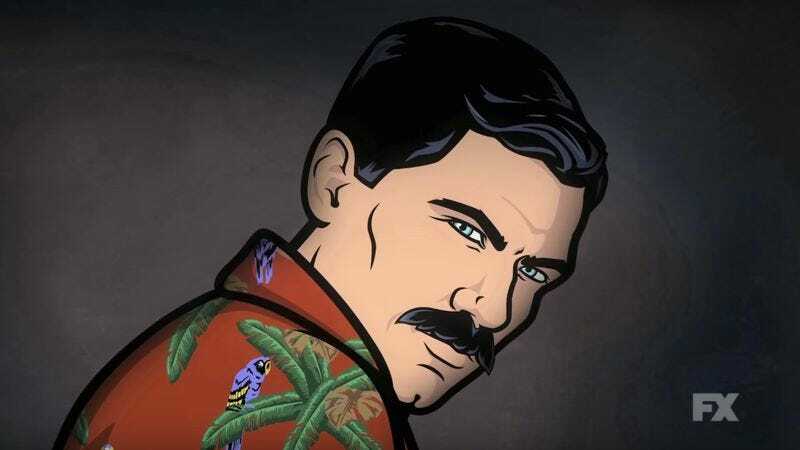 Archer (FX, 10 p.m.): In his pre-air review of Archer’s seventh season, Erik Adams argues, “At this point, Archer can put these people in any position it wants and still find satisfying results. (Phrasing! )” Which is good because the show is once again giving itself a soft reboot (also phrasing?). After being blacklisted by the CIA, the team decides to launch new careers as private investigators in L.A., lending the season a decidedly Magnum, P.I. vibe. William Hughes has already pledged his allegiance to the newly created Figgis Agency and is ready, willing, and able to file weekly reviews of their escapades. Life In Pieces (CBS, 8:30 p.m.): In the first-season finale of this CBS family sitcom, John and Joan reveal a secret they’ve kept for 35 years. Hopefully the secret is that they’re actually actors James Brolin and Dianne Wiest. The Eighties (CNN, 9 p.m.): Having already covered The Sixties and The Seventies, CNN sets about detailing the history of The Eighties as well. The network presumably had to delve deep into academic circles to find specialized historians knowledgeable enough to discuss the premiere’s subject matter: The VCR and the remote control. Shades Of Blue (NBC, 10 p.m.): There’s good news and bad news for fans of Jennifer Lopez’s cop bob. The bad news: The Shades Of Blue first-season finale brings with it the departure of cop bob. The good news: The show has already been renewed for a second season. Cop bob will be back! Tonight Harlee makes a deal with Stahl to try to protect her crew, all while ensuring her luscious locks look appropriately tousled. Terminator: The Sarah Connor Chronicles, “Pilot” (CW Seed): Speaking of apocalyptic-themed television, did you know that every single episode of Terminator: The Sarah Connor Chronicles is available for free right now on the CW Seed streaming platform? Watch Cersei Lannister (a.k.a. Lena Headey) try to change the future while ensuring that Earth still has one.